Beckett and Bono? Yes, and pizza. As a U2 and theater fan, I've been helping out with a very funny play called "Bono and The Edge Waiting for Godomino's," onstage now in the L.A. area, that I would love to invite everyone to. 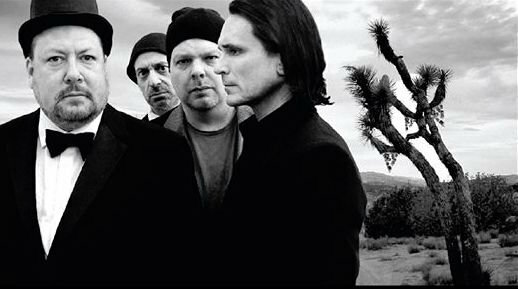 The play is a satire of Beckett’s “Waiting for Godot,” except instead of two hobo-like guys waiting around for a nonexistent God figure, it’s Bono and The Edge waiting for a Godomino’s pizza delivery person to come so they can get in touch with the Common Man, or woman, because as mega-celebrities they’ve lost that. U2 fans will LOVE all the details about Bono, The Edge and the band that permeate the entire play. It also includes a few satirical excerpts of U2 songs, played by writer-director and Bono actor Richard Lucas on guitar. The play premiered at the Hollywood Fringe Festival (where it was nominated for and won numerous awards), and is now on its third run, at the Brickhouse Theatre in North Hollywood, 4 pm. Saturdays through May 26 (just two shows left in this run!). Everyone who sees the play loves it; tons of reviews and more info are available at www.WaitingForGodominos.com. Tickets, $15, at http://Godominos.BrownPaperTickets.com.